Palm wine might not always come in sophisticated packages or with luxurious, recognisable brand names, but in African settings, its importance cannot be downplayed. The sweet sap got from palm trees such as palmyra, date palms, and coconut palms are commonplace in mostly rural communities, where sourcing it provides a steady stream of income for tappers. Palmie, as it is fondly called, is deeply rooted in some traditions in West Africa. Take the Igbo culture, for example, the local beverage is part of the requirements for a lady’s bride price. Their traditional marriage ceremony igba nkwu meaning palm wine carrying ceremony is clearly named after the drink. It is the only drink that has a recognised club in some universities in Nigeria, the palm wine drinkers club. Freshly tapped palmie is rich in Vitamin C, Yeast, Zinc, Iron, Vitamin B Complex, Amino Acid, Carbohydrate, Protein, Sugar, Good Bacteria, and Potassium. With all of these, one can only imagine how much benefit this happy wine has to offer. The traditional saying, “palmie cleans the eyes” is true. Palmwine contains Vitamin B1 (thiamine), Vitamin C (ascorbic acid) and yeast which is necessary for our eye improvement. The potassium in palm wine drastically reduces the risk of heart failure and improves cardiovascular health. 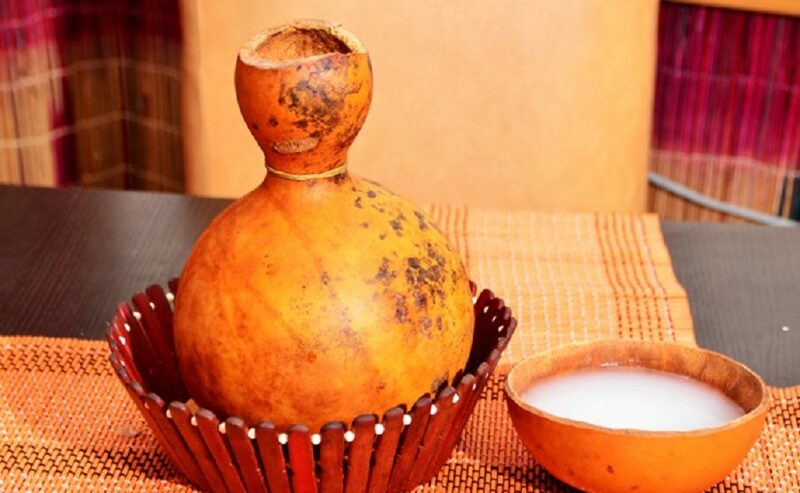 Palm wine is good for your hair, nails and skin. This is due the presence of Iron and Vitamin B Complex in the wine. Palm wine is very useful in the fight against free radicals. Anti-oxidants such as Vitamin C help reduce the damage done to the cells by these free radicals. With the above stated, it is obvious that palm wine plays an important role in achieving overall good health and is a great way to start the year. It is important to state here that to get these nutrients, it has to be taken it is freshly tapped or else it will ferment and become a highly concentrated alcoholic drink. On a lighter note, pass on the gourd.